For the similar almond cake popular in Australia and New Zealand, see Friand. A financier (French pronunciation: ​[fi.nɑ̃.sje]) (formerly known as a visitandine[clarification needed] (French pronunciation: ​[vi.zi.tɑ̃.din])) is a small French almond cake, flavoured with beurre noisette, usually baked in a small mold. Light and moist with a crisp, eggshell-like exterior, the traditional financier also contains egg whites, flour, and powdered sugar. The molds are usually small rectangular loaves similar in size to petits fours. Originally made by the Visitandine order of nuns in the Middle Ages, the financier was popularized in the nineteenth century. 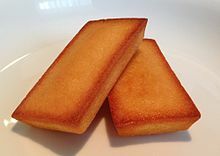 The name financier is said to derive from the traditional rectangular mold, which resembles a bar of gold. According to another tradition, the cake became popular in the financial district of Paris surrounding the Paris stock exchange, as the cake could easily be stored in the pocket for long periods without being damaged. ^ a b Suas, Michel (2008). Advanced Bread and Pastry. Cengage Learning. p. 474. ISBN 978-1418011697. ^ a b Hesser, Amanda (November 24, 1999). "The Pastry Chef's Rich Little Secret". The New York Times. Retrieved 29 May 2014. ^ Fabricant, Florence (Oct 3, 2006). The New York Times Dessert Cookbook. New York: Macmillan. p. 165. ISBN 978-0312340605. ^ Greenspan, Dorie (2010). Around My French Table: More Than 300 Recipes from My Home to Yours. New York: Houghton Mifflin Harcourt. p. 455. ISBN 978-0547504810. ^ Cecile Delarue (9 January 2015). The Everything Easy French Cookbook: Includes Boeuf Bourguignon, Crepes Suzette, Croque-monsieur Maison, Quiche Lorraine, Mousse Au Chocolat...and Hundreds More!. "F+W Media, Inc.". pp. 248–. ISBN 978-1-4405-8396-4. ^ Mina, Michael (2010). Michael Mina: The Cookbook. New York: Hachette Digital, Inc. ISBN 978-0821257531. ^ Leaf, Alexandra (2006). Van Gogh's Table: At the Auberge Ravoux. New York: Artisan Books. p. 209. ISBN 978-1579653156. ^ Hochbaum, Susan (2011). Pastry Paris: In Paris, Everything Looks Like Dessert. New York: New York Review of Books. p. 118. ISBN 978-1892145949. Wikimedia Commons has media related to Financier (cake). This page was last edited on 26 October 2018, at 18:54 (UTC).